Captain Jean-Luc Picard: This the ’46? Robert Picard: ’47. You’ve been drinking too much of that artificial stuff. What do you call it? Synthehol? Spoiled you. Ruined your palate. Captain Jean-Luc Picard: On the contrary. I think that synthehol heightens one’s appreciation for the genuine article. For those who may not be up on their Star Trek: The Next Generation, the above is a quote from an episode in 1990 wherein Captain Picard’s brother takes a dig at him for drinking only “synthehol” on board the Enterprise, not to mention more “Earl Grey, hot” than one would believe a Frenchman to drink. Naturally, when watching the series over 25 years ago now, this all seemed like science fiction, but about two weeks ago an article about a company who is working to synthesize exact profiles of famous wines made social media waves. It goes without saying that many decried it as ridiculous and pointless and stated that there would never be any way to truly replicate “terroir” or the sense of place that these wines hold. I would counter that this day is indeed coming as just having returned from Georgia, I tasted wines made in the ancient method via kvevri which tasted completely different than those made with the same grapes via stainless steel. I also tasted some made in the modern system with the native varieties of Georgia but using commercial yeasts which had no sense of place and tasted more like general Pinot Gris. This comes shortly after attending an amazing talk about yeasts at the ICCWS 2016 and tasting samples that showed yeasts played a great deal more in forming the taste profile of the wine than anything else, although I’ll write more about that at a future date. Suffice to say, with each vintage of wine, the science side of things grows every more advanced and little by little we are deconstructing the mystery of why things taste the way they do. We have identified all manner of chemical compounds in wines that create the sensation of the flavors we recognize. That peppery aspect to Australian Syrah? That comes from something called, “rotundone” for example. Even a broad term like “minerality” is slowly being broken down into its constituent parts. 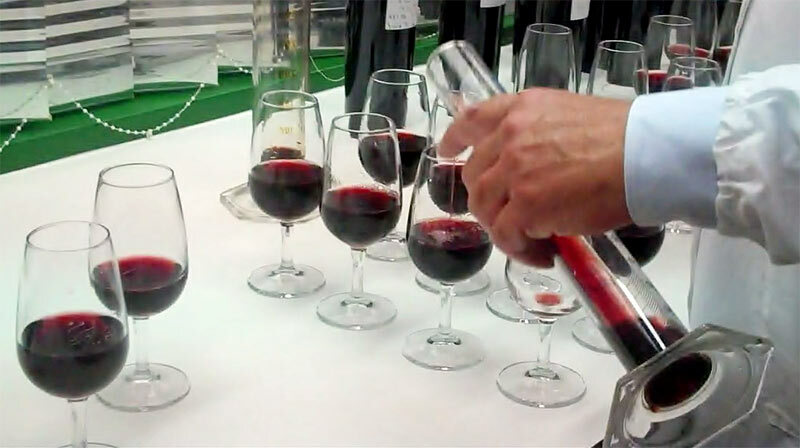 So, while the company doing this research in to fake wines may not succeed, someone, someday will indeed be able to create a replica from a pile of chemicals and raw alcohol that will fool most everyone. I’ve often wondered how people will be able to take on the Master of Wine and Master Sommelier exams in the future as the differences between New and Old World styles overlap and disintegrate. Looks like the bigger challenge in the exam could someday be telling lab wine from the field stuff. How crazy! My first thought is why… but then I suppose a lot of “why’s” are just to see if we can.